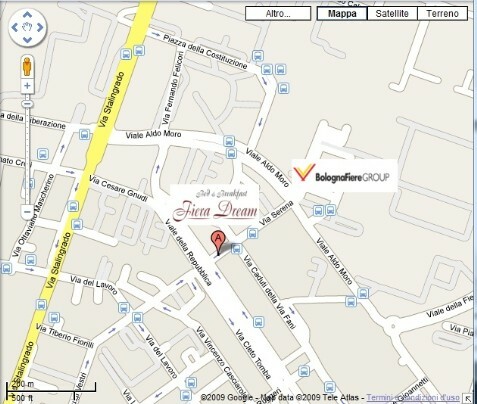 On arriving at Bologna, take the A14 motorway and exit at Fiera. After the exit head straight for 50/100 metres and take the first street on the left. Head straight for 50/100 metres and turn right. Head straight. At the roundabout take the 2nd exit and continue straight. Turn right into Viale Europa. Continue straight until arriving at the roundabout and take the first exit into Viale Aldo Moro. At the third set of traffic lights (before the start of the traffic divider) turn left into Via Serena. On arriving at the intersection, turn left into Via Caduti della Via Fani and park your car (from this point onwards Via Serena becomes a one-way street). The main entrance is located under the portico of Via Serena (20 metres).